Whether it is winter or summer, a cup of freshly brewed coffee in the morning makes your whole day awesome. And to get the perfect brewing, freshly ground beans are absolutely perfect. Pre-ground coffee seems to be the convenient choice, but for the quality, the freshly ground beans are comparatively best. Grinding the coffee beans just before brewing it, delivers an amazing cup of coffee. But, if you think that grinding the coffee beans is such a complicated task, don’t get worried. As technology has gifted us the best gadget for this- The Coffee Makers with Grinder also known as Bean To Cup Coffee Machines. The fresh flavor it delivers to the cup of coffee is extremely mind-blowing and unbeatable. Bean to Cup Coffee Machines are the coffee makers that come with in-built grinder that not only makes the coffee but also grind the coffee beans before the coffee making process. And thus you will get the taste of freshly ground coffee. In a more simple way, we can say that coffee makers with grinder take the hard work out of making coffee, grinding and pouring your coffee automatically. And thus offering you the ultimate convenience of delivering the benefits of freshly ground coffee without any hassle that takes a lot of effort to do the job manually. Well, the coffee beans start to lose their aroma, flavor, fragrance, and oils after they are ground up. The more the time between grinding and brewing, the more the flavor reduces away. Coffee makers with built-in grinders produce a fresh, barista-quality coffee. Just press the button on, and the machine can do everything from grinding, coffee making, and pouring it. And so you can get the fresh coffee experience with real beans. To get the more detailed information on coffee makers with grinder, have a look at our Buying Guide Section. So, let’s have a look at our top picks of coffee makers with grinder or bean to cup coffee machines that are best-in-class and definitely suits your requirement. So, here is the detailed review of each of our best picks of bean to cup coffee machines along with their full specifications and buyers reviews as well. Since the price of the product is not just everything, so it is very much important to consider features and benefits too to get the preferred choice. And I am sure; it will make you choose your favorite one more conveniently. 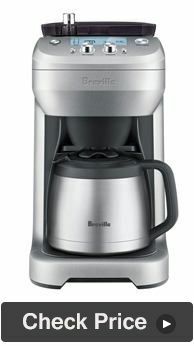 This grind and brew coffee maker from the brand Breville comes the first in our list for its outstanding features and superb performance. It comes with an adjustable grinder and calibration function allowing you to grind the coffee just before brewing it — means you can customize the grind size and coffee volume according to your personal coffee preferences. 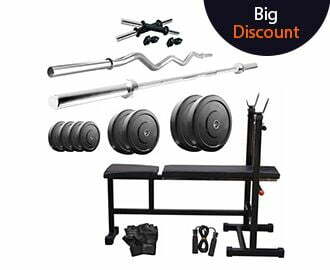 The machine comes with eight strength settings that you can choose accordingly. Plus there is also the option for pre-ground coffee letting you brew the coffee just the way you like it. This coffee maker has a stainless steel carafe equipped with the burr grinder in which you can brew even a single cup and also up to 12 cups according to your needs. And the best part is that the burr grinder delivers the more consistent and precise size of the coffee for optimum flavor. The Breville BDC650BSS grind and brew coffee maker also features an LCD screen to provide you the real-time feedback on grind size, grinding time, water level, strength selection, and brewing time, etc. and so you have full control over the coffee making process. 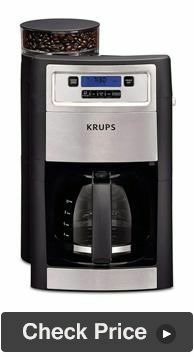 The appliance also has the programmable auto start function that automatically starts grinding and then brewing coffee at the selected time. Also, featuring the Steep and Brew technology, the appliance lets you brew any size with ease even without compromising the quality. Plus, the Pre- Brew temperature control feature delivers water at the ideal temperature from cold start. And the next is this super automatic espresso machine from the brand Delonghi Magnifica. Whether you are fanatic of the espresso for your caffeine hit or prefer a longer coffee, this superb bean to cup coffee machine can deliver the same. Get more creative with your latte, cappuccino, Americano or even macchiato, with this amazing easy to use kitchen appliance. The first thing that attracts you is its appealing and eye-catching design with black and silver color scheme. It comes with a surprising number of customization options. With this bean to cup coffee machine, you can make two cups of espresso at the same time. This coffee maker with grinder comes with a manual cappuccino device that easily and quickly prepares a great cappuccino or hot milk. The machine features more smart and neat control option giving you the professional feel. Also, the machine is very easy to use with its simple interface for grind settings, strength settings options, as well as change between beans or pre-ground coffee. It is equipped with the conical burr in-built bean grinder that expertly grinds the coffee beans as per your coarseness setting. The appliance also comes with a compartment for ground coffee. You can switch between using the ground coffee or bean compartment with a single button press. Plus, when it comes to taste, the espresso from Delonghi Magnifica Esam 4000.B Bean to Cup Coffee Machine is amazing and excellent. The machine also comes with a Thermoblock system that lets the machine to heat up only the required amount of water for the next coffee serving and that greatly reduces the heat up time. There also comes an Eco button on the machine for saving energy. For all the coffee lovers, this grind and brew coffee maker with fully automatic function is another smart choice. The machine never fails to deliver the perfectly balanced and great textured cup of coffee every time. Its eye-catching streamlined design with a brushed metal finish is the first thing that attracts you. And so this beautiful addition to your kitchen makes your kitchen interior extra appealing. The capacity is too good as it comes with 12 cup glass carafe that makes it easy to brew multiple cups in one go, with a one-to-four cup feature integrated in it. And its unique Brew Pause feature lets you enjoy a fresh cup before the brewing process completes. The machine grinds the whole beans to perfection for the freshest, gourmet coffee house flavor. And thus you can get the best coffee flavor every time. What is another amazing part is its large control panel that makes it easy to program and use the coffee maker? The machine comes with 24-hour fully programmable touch display with an adjustable auto shut off feature for enhanced safety. Also, the reusable gold tone commercial style permanent filter integrated with it adds extra convenience. 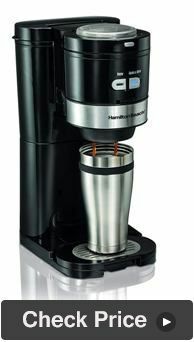 This model of the Hamilton Beach Grind and Brew coffee maker is one of the economical options for all the coffee lovers who want a quality-tasting espresso at an affordable price. The machine offers you the option to grind whole beans for the deliciously fresh coffee or save time and brew your traditional ground coffee. It comes with the capacity to brew up to 6 ounces of fresh coffee immediately. One of the best part of this bean to cup coffee machine is its ease of use and simple operation. The machine features two large buttons on the front that offer one-touch operation and make brewing a snap. It comes with an adjustable cup allowing you to brew into your favorite traditional mug when you are at home or into a travel cup when you are on-the-go. So brewing is up to you. It also includes a scoop for easy measurement of the beans of coffee grounds. The machine comes with an automatic rinse function that will clean the grinding chamber to prevent clogging. It is also featured with the dual spout that can deliver two streams of coffee at the same time. Means you can make two 8-ounce cups at the same time. The Black & Decker CM5000GD coffee maker with grinder is yet another smart choice for those who are budget conscious but still don’t want to compromise the taste. The machine quickly grinds the fresh coffee beans and brew it quickly for the most aromatic flavor. For all those who have daily busy schedules can use its pre-program function for added convenience. This coffee maker with grinder also comes with the patented 24-hour programming feature that lets you preset the automatic grind and brew options. You also have the option to turn the grinder off, if you prefer to use pre-ground coffee rather than whole beans. The machine comes with adjustable strength settings so that you can achieve your preferred grind size and coffee strength. The appliance features the most easy to use interface with a clear viewing display to provide you the real-time feedback on grind size, grinding time, water level, strength selection, and brewing time. 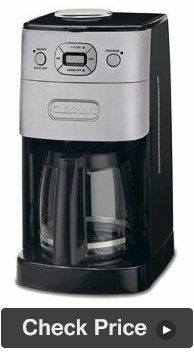 This grind and brew coffee maker come with the glass carafe having the capacity to brew up to 12 cups. Even there is no need to use paper filters with this unit because it has the permanent filtering system that is attached to the built-in grinder. And are very easy to remove and clean for added convenience. The machine also comes with the Sneak a cup feature making it easy to take a single serving without any mess. 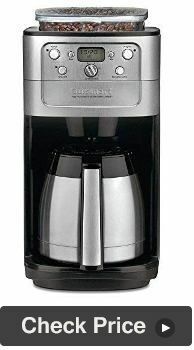 With an extremely intuitive and user-friendly interface, this coffee maker with in-built grinder from the brand Cuisinart is another best buy to get your favorite espresso shots every morning. Its smart and sleek black and silver color scheme make a fine addition to your smart kitchen. The machine comes with a burr grinder that grinds the coffee without influencing the integrity of the coffee beans. And so maintaining the true and superior flavor and freshness. It has the thermal cafe with the capacity to brew up to 12 cups, and the carafe is double walled to lock the heat and freshness. When it comes to bean hopper, it is large enough to accommodate up to 8 ounces of whole coffee beans. With the integrated strength selector and the grind control functions of the machine, you can easily fine-tune the intensity and volume of your coffee as per your preferences. Even you can choose from three strength settings- strong, medium, and mild as per the taste you want. However, if you don’t want to use the grinder and prefer to use the pre-ground coffee, the machine also provides the option for switching off the grinder when not in use. The appliance has a permanent charcoal filter ensuring the freshest coffee flavor by removing the impurities found in tap water. Plus, 24-hour programming features auto brew and auto shut off of the machine as an added safety feature. This is one of the coolest and most versatile grind and brew coffee makers in the market which is not only compact but also packed with a whole lot convenience. With its fully automatic operation, you can get the perfect cup of coffee whenever you want. This one excels in style, function, and awesome features. This 10 cup drip coffee maker comes with a 5-setting conical burr grinder that lets you choose from a variety of grind settings from coarse to fine. It comes with a 2 to 10 cup grinding selector feature for more control as it allows you to customize the quantity for the perfect amount of freshly brewed coffee. What is especially best is its highly intuitive control panel with an LCD display allowing your coffee making experience absolutely flawless. The strength selector feature offers the optimum flavor through the three brewing settings. Though you can choose from strong, medium, and mild as per your taste preferences. This grind and brew coffee maker also comes with the keep warm feature for two hours. And with its convenient pause and serve function, you can pour a cup of delicious coffee at any time during the brewing process. The machine is also featured with a removable gold-tone filter offering you the more hassle-free coffee making process as well as easy cleaning experience. 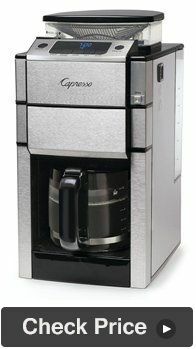 The Capresso 487.05 Team Pro Plus brings the new technology for a bean to cup coffee experience. Its sleek stainless steel exterior with a lot of multiple advanced features make this coffee maker with grinder a unique choice for your home. This all-in-one coffee maker allows you to start straight from the bean and finish with the smooth and rich flavored cup of coffee. It comes with a professional quality, fully integrated conical burr grinder that makes grinding of the coffee beans more easy just before brewing it and thus delivers the rich taste and bold flavor. Moreover, it also has the two-step grind and clean process that ensures the bean and ground coffee are not left in the grinder to affect the taste of the grinds. The best part of this bean to cup coffee machine is its fully adjustable grind and strength settings making it easy to match the brew strength according to your preferences. It is integrated with 24-hour programmable clock/timer with easy to read display making the operation more easy and convenient. The appliance come with the glass carafe having the capacity of 12 cups to brew at a time with the convenient ergonomic handle and brew-through lid. The permanent gold tone filter comes with it is easy to use and clean. 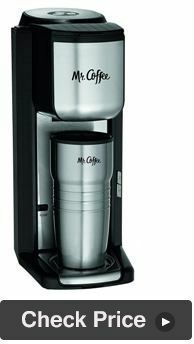 Brewing a single cup of coffee is now easier and tastier using whole beans or coffee grounds with this grind and brew coffee maker from the brand Mr. Coffee. This bean to cup coffee machine intensifies the taste in your cup. Just use the beans of your choice, and this machine can let you enjoy the coffee the way you like it with a lot more richness and flavor. The machine is very easy to use with its simple one-touch operation. It comes with the grind off option if you prefer to use the pre-ground beans instead of grinding the whole coffee beans. If you want your drink on the go, the machine can dispense your coffee straight into the included stainless steel travel mug. Even you can use any travel mug with a 16-ounce capacity or less. Moreover, the best is its flexibility, means it has an adjustable cup tray to accommodate large cups or travel mugs or short cups for splash-free brewing. There comes the large-sized permanent filter to ensure optimal blade performance and also fast and easy to clean. Though the price is high, but for features and performance, this coffee maker is really awesome. But if you think why we have put this one in the last of our list, the reason is simply its higher price. So, if you want something with high quality, this is the machine for you. The Jura A7 bean to cup coffee machine comes with a built-in coffee grinder for whole beans, but you can also use pre-ground coffee as well. This automatic coffee maker can makes a variety of black, milky coffees, milk foam, and hot water at just a simple press of the button. Plus, its elegant design appeals the overall look of your kitchen interior. This coffee maker with grinder comes with an advance pulse extraction process to pass the hot water through the grounded beans in short intervals letting you make barista level coffee every time. Whether it is Latte macchiato, Ristretto, Espresso, or Cappuccino, you can get the perfect shots every time. The appliance is also equipped with the intelligent water system to provide the fresh water for making the aromatic and flavorful coffee. The machine also has an integrated foam maker to give you the lightest milk foam. There is a screen with text prompt that makes the appliance easy to use. Also, the convenient automatic cleaning programs make the machine easy to clean. The first and foremost upside of coffee makers with grinder is their ease of use. With these machines you, don’t need to put any manual efforts, just use your favorite coffee beans, and the machine can do the rest of work for you. No need to purchase an extra grinder, and thus these machines justifying the extra price. Fresh and extremely rich flavored coffee is the another main benefit of bean to cup coffee machines. The coffee makers with grinder guarantees the fresher tasting coffee. The grind and brew coffee makers offers you the full control over what goes in. It means you can monitor the quality without worrying about the contaminants and adulterants. With different types of grinders available in a bean to cup coffee machine, you can easily select the grind quality. Means you can grind your coffee to the desired level of fineness and coarseness. The coffee makers with blender allow you to make your own blend. You can mix different types of coffee beans at the preferred ratio to create your own blend for a more tasty and rich coffee. And thus, you don’t need to rely on the packaged coffee. Blade Grinder- If you want a least expensive option, the bean to cup coffee machines with a blade grinder is an ideal choice. It works much like a blender by using the fast-spinning blades to cut up the coffee beans. But the grind it offer is generally inconsistent in size. And the main downside with the blade grinders is that the heat generated by the friction can spoil the taste of coffee. Burr Grinder- Those who prefer high-quality coffee from the comfort of their home, coffee makers with burr grinder is the best choice. However, these are slightly expensive, but the grind is more uniform for a better cup of coffee. With these type of grinders, you have the option to choose from a variety of grind sizes. And this lets you adjust the most appropriate grind size depending upon the type of coffee you are going to make. The one with excellent performance and control, even with the LED screen provides you the real-time information on everything from water level to brewing time. The programmable system with the most user-friendly interface lets you operate the appliance in a very hassle-free manner. It is also very much important to consider the capacity of coffee you want every day. Some come with single-serve cups, and some have multiple carafes. Also, check that the machine must be compatible with cups of different sizes. We have already discussed about the different types of grinders used in coffee makers with grinder in the above section. So, if you want more flavor and consistency burr grinder is the ideal option, but if you are on a tight budget, you can opt for the blade grinder as well. Always opt for the machine having replaceable filters that is more easy to use. Coffee makers with grinder that allow you to switch between the permanent filter and paper filter, or use them together, offer the clear brews every time. The coffee makers with grinder come with two type of carafes- The Glass and Thermal. With the Glass carafes, you can monitor the proceedings very well. But the major downside with these carafes is that they don’t keep your coffee warm for the long time. On the other side, thermal carafes are made up of stainless steel that doesn’t allow you to watch the proceedings, but as an upside, they can keep your coffee warm for the long hours. Automatic shut off for enhanced safety. Auto Start to start grinding and brewing at a preselected time. Warming Plates to keep your carafe warm and fresh. Different Grind settings to make different type of coffee that includes different level of fineness and coarseness. The Programmable System for the most easy operation. 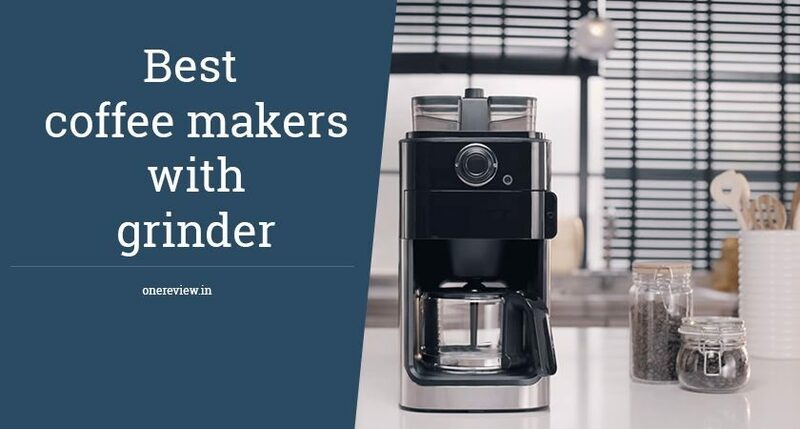 Well, that’s all for our best picks of coffee makers with grinders that will definitely deliver you an amazingly flavored and textured coffee whenever you want. Just push the button and done. It’s quite simple over grinding the coffee beans manually for a great cup of coffee. Hope the information provided in the blog will let you choose the best bean to cup coffee machines depending on your preferences and budget.